On a Friday night in 2007, loud knocking on the front doors and intense jackboots walking on the unevenly paved narrow streets of Nowhatta woke up Showkat, then 14. 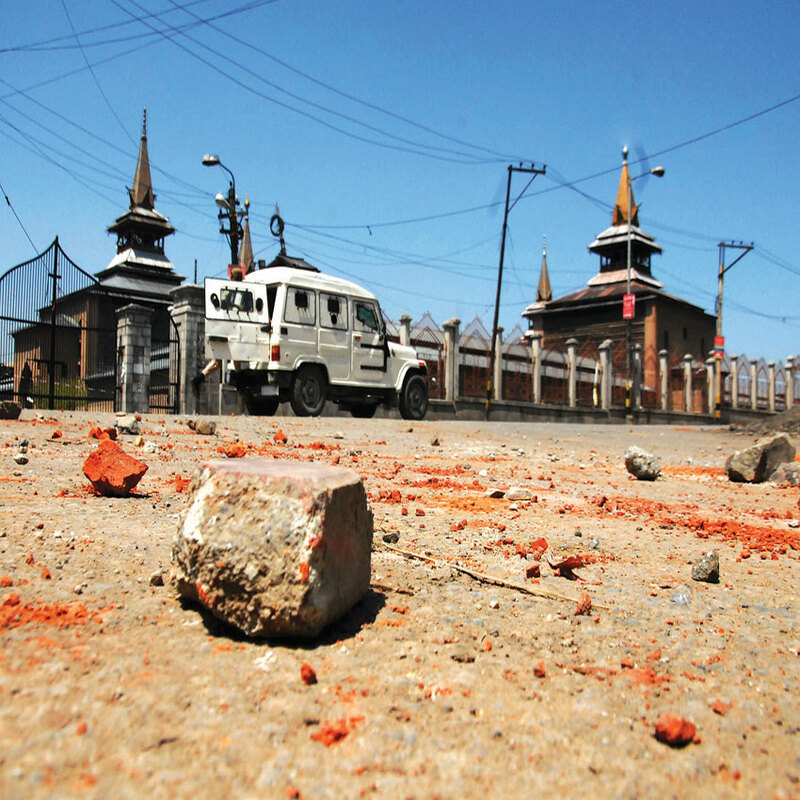 Instantly, he knew what it meant: a crackdown on stone-pelters who were part of the post-prayer protests outside Jamia Masjid, the historic mosque of Kashmir. Before he could have dashed out of the house and vanished into the maze of alleys, he found himself surrounded by cops from Nowhatta police station, barely five minutes walk from his home. By midnight, Showkat and four of his close friends, and two other boys from the neighbourhood, were behind the bars. Five days later when Showkat and his friends walked free from the lock-up, they vowed to continue resistance, a term synonym to freedom, locally. 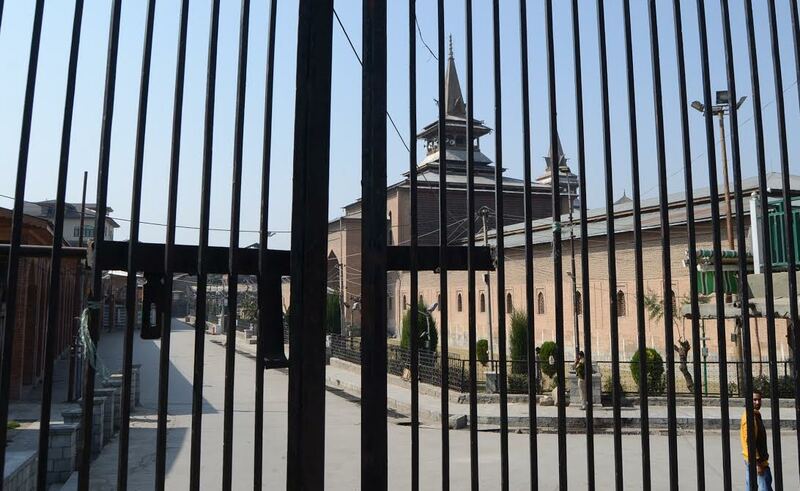 An eighth standard student then, Showkat belongs to an affluent family living in the vicinity of Jamia Masjid, a 1394 AD structure build by Shahmiri Sultan Sikandar. The grand structure has given the place a historic centrality and draws tens of thousands of worshippers every Friday. Its influence on the socio-political landscape of Kashmir has remained undisputed throughout the history. Young and restless, Showkat remained unchanged and continued stone pelting on police and paramilitary, every time, the belt poured out against “atrocities and killings”. In 2008, during protests against economic blockade of Kashmir by Jammu based far-right groups, Showkat had a narrow escape when a bullet brushed his skull, just above his left ear, leaving a visible and indelible mark as reminder. His “raw anger against the system” found a new direction after Wamiq Farooq was killed by a tear-gas shell that hit his head on January 30, 2010 in Rajouri Kadal. The subsequent protests helped Showkat get in touch with like minded boys from the neighbourhood who also felt “frustrated by the helplessness”. Four months later, on April 30, 2010, army claimed to have foiled an infiltration bid in Machil sector of Kupwara district, by killing three Pakistan based militants. Later, police revealed that the encounter was staged and the three men, branded as militants, were civilians from Rafiabad. It triggered massive protests. On June 11, 2010, unmindful of the protests and brewing anger, Tufail Matoo, 17, a Class 12 student was shot in the head by a tear-gas shell outside Rajouri Kadal’s Gani Memorial Stadium, not far away from Nowhatta. Protests erupted, first in downtown and then fanned out to other parts of Kashmir, starting a cycle of killings, funerals, protests and killings. During one such protest in Hawal Chowk, barely ten minute’s walk from Jamia Masjid, Showkat’s right eye was hit by a marble, shot by CRPF personnel holding a slingshot and an AK47. “I was lucky he didn’t fire from his gun,” said Showkat. However, the injury didn’t stop him. Instantly, Showkat was upgraded by police to Nowhatta’s most wanted stone-pelter. Interestingly, this helped him earn many friends and followers. “I lost an eye but got so much love in return,” said Showkat. “It was never so dangerous to live in Nowhatta as it is now,” said Mohammad Yousuf Khan, 65, who runs a small fur workshop in Roshangar Mohallah, a small alley barely five minute’s walk from Jamai Masjid. Khan recalls how in pre-militancy era supporters of Mirwaiz Molvi Farooq and National Conference cadre used to clash with each other on-and-off in Nowhatta. “There used to be stone-pelting too, but not as intense as it is now,” recalls Khan. But Nowhatta’s tryst with stone-pelting and processions is not a recent phenomenon. After Ghulam Mohammad Shah toppled his brother-in-law Farooq Abdullah’s government in 1984, the incidents of clashes between political workers intensified. 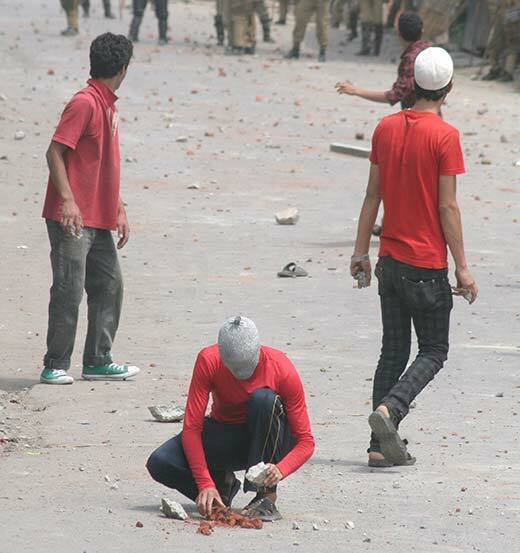 During one such clash outside Jamia Masjid, these rival political workers threw corn cobs at each other followed by stones. 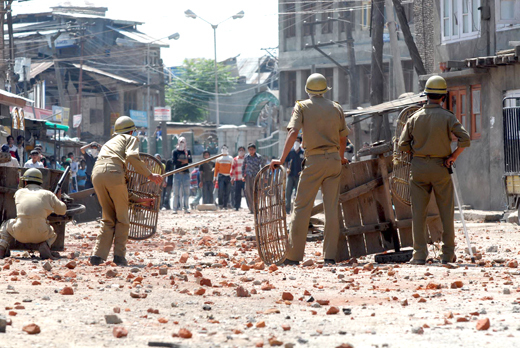 “Stone-pelting is an old practice, but I have never witnessed anything like this,” said Khan. But soon stones would resurface in Nowhatta in a dramatic manner, thanks to an al-Umar Mujahideen sympathizer and his two friends. A day before Eid-ul-Fitr in 1998, Ashiq Ahmad Zaroo, then 26, was playing with his friends outside Jamia Masjid’s main entrance. Zaroo and his friends had no idea that two pair of eyes watched them keenly from inside the Kawoosa House, then a BSF garrison quite notorious for torture, located barely fifty meters across the road. The eyes belonged to BSF officers Rajveer and Kalia, both still remembered by Nowhatta. Unaware of the eyes, Zaroo took out a firecracker, lit the open end of its wick, and threw it at one of his friends. Within seconds it exploded at his feet with a loud bang. Taking a cue from Zaroo, his friends followed the suit and started throwing firecrackers at each other. “We were laughing and playing. It was time for merriment as markets were open for Eid,” said one of the Zaroo’s friends who was part of the play, on condition of anonymity. All of the sudden, a group of BSF men, led by Rajveer and Kalia rushed out from Kawoosa House, and came within the stone-throw distance of Zaroo and his friends. To everybody’s surprise, instead of using canes or tear-gas shells, as was the norm, Rajveer and Kalia began shouting slogans in favour of JKLF, a militant outfit which had modest footing in Nowhatta. “We responded by raising slogans in favour of Hizb-ul-Mujahideen,” recalls Zaroo’s friend. Within no time, a number of boys and local shopkeepers joined Zaroo’s and his friends. 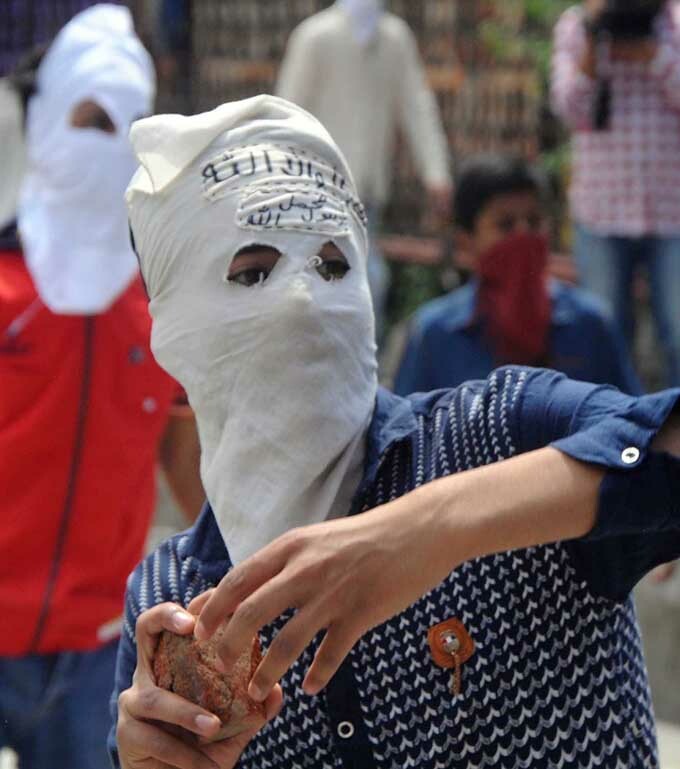 “What started as a play led to resurgence of stone-pelting in Nowhatta,” said Zaroo’s friend with a smile. Four years later Zaroo was picked up by the forces for his alleged link with militants. He was tortured to the extent that he now needs crutches to walk. “Once out of jail he was not the same smiling youngster anymore,” said his friend. Zaroo, who hails from a well-off family in Nowhatta, now roams around, mostly near Kawoosa House, like a lunatic. Once behind the lock-up, Showkat was slapped with seven FIR’s. He keeps a small pocket size diary in his wallet to keep tab of dates to avoid skipping a court appearance. Also, Showkat utilised his time in mainland India to undergo five surgeries in his pellet hit right eye. “It cost me around Rs 11 lakhs to get an artificial eye,” said Showkat. Once back from his sojourns Showkat started catching up with his friends, who by now had brought some semblance in stone-pelting. One among his distant friends was Sajad Ahmad Gilkar, a dashing boy in his early twenties, whose free-flowing locks made him a known face in Nowhatta. In late 2014, Sajad came under police radar after ISIS (Daesh) flags were first waved outside Jamia Masjid. “After ISIS flags appeared in Nowhatta, we started looking for Sajad, as he was a known pelter. We raided his house several times, even his relative’s houses, and then finally after a month’s search we nabbed him from Bemina,” said a Dy SP rank officer who was posted in Nowhatta police station as SDPO twice. Not only did waving of ISIS flags unnerve security grid but also sent literal shockwaves across stone-pelters. “Nobody knows what ISIS stands for. There is still confusion about its authenticity,” said Showkat, who headed the group that questioned the philosophy behind ISIS flags. Bashir, a 90s era militant sympathizer, who now runs a shop near Jamia Masjid, is one of the ideologues for Showkat and other small groups. Bashir recalls how he used to struggle in his room when BSF officers Rajveer and Kalai tortured helpless youngsters inside Kawoosa House. “I have grown up listening to their cries. How can I forget them,” said Bashir. Bashir classifies stone-pelters in two groups: one driven by pure ideology and is composed of those youngsters who have lost a relative, or father, or brother, or uncle to forces brutality in 90s. 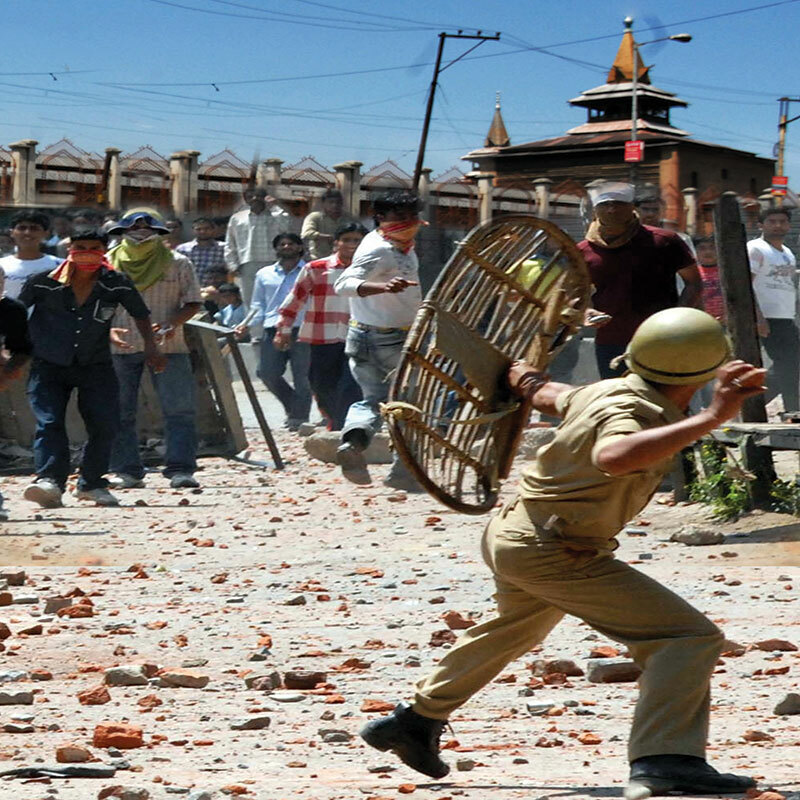 “This makes around 98 percent of stone-pelters,” claims Bashir. Bashir recalls one such controversy when a group of boys set afire to posters bearing Secretary General Hezbollah Hassan Nasrullah’s image. “This act we knew would stoke sectarian tensions in the area, so an emergency meeting was called to see who was behind it,” said Bashir. On June 29, 2017, Sajad, who by now was named in a number of FIR’s in police stations across downtown, appeared in Bemina Court in a case titled Tahir Nadal. An hour later his impatient father Nazir Ahmad Gilkar, a mason, called to know what happed in court. “They gave me another date (to appear),” Sajad told his father over phone. Relieved that Sajad is not detained again, Nazir went on with his routine work. But when Sajad didn’t return in the evening Nazir called him on his cell-phone again. “This time it was switched off. His other phone was at home,” recalls Nazir. The next morning Nazir along with his brother went to police station Nowhatta to seek whereabouts of his son. “They told me to check other police stations where cases are registered against him,” recalls Nazir. For next 13 days Nazir and his brother kept looking for Sajad at all possible places but without any success. Then Sajad asked his father for forgiveness for putting him through trouble all these years because of his hot-pursuit with police. “Then he asked for his mother,” recalls his father. Nazir, who was in Pampore at that time for a night stay, wanted to fulfill his son’s last wish, but was helpless. “Son, I am not home,” Nazir told Sajad amid tears. After a brief pause Sajad asked his father for a favour, something Nazir couldn’t refuse. “Tell her (mother) that I am sorry. I gave her nothing but pain for all these years. Tell her to forgive me,” he told his father before he disconnected the call. Without telling anything to his host Nazir rushed out in the rain and drove all the way to Srinagar on his scooter. Later Nazir came to know that Sajad had called one of his uncles too, hoping he would help him talk to his mother. “But his uncle was not home too. His last wish remained unfulfilled,” said Nazir. Within an hour after the call, Sajad was killed along with two other local militants at Rudbugh village in Budgam. 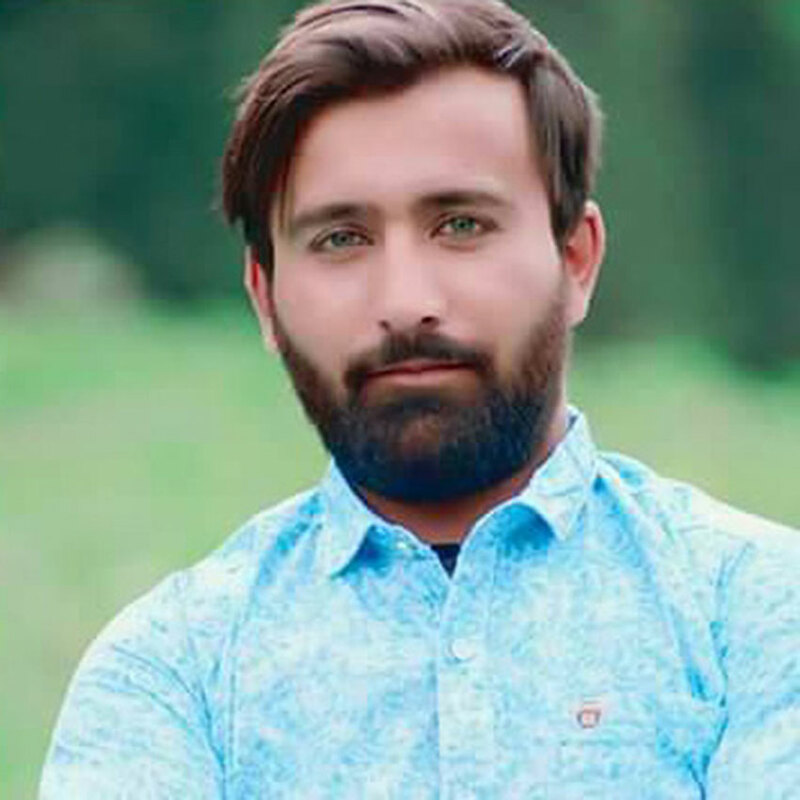 “Till next morning we waited for his body but nobody knew where he was kept,” said Nazir’s brother who visited the Rudbugh village at daybreak with Sajad’s picture to confirm. But, a Dy SP rank officer who was posted in Nowhatta police station as SDPO twice, blames the “glamour” attached to the present day militancy for Sajad’s choice. “If he (Sajad) was really pushed to the wall by police, as claimed by his family, then why didn’t he pick up gun earlier? He joined now because militancy is in fashion nowadays,” believes the officer. But despite blames and counter-blames Sajad’s transition from stones to guns has neither gone unnoticed nor un-admired among his fellow stone-pelters. “I am afraid his killing will start a dangerous trend of ‘next step’ for stone-pelters who face multiple FIR’s and are hunted constantly,” feels Bashir. 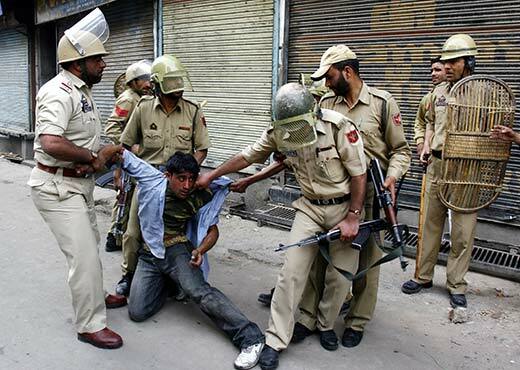 A youth being taken into custody during protests in this file photo. The entire belt is hugely congested. Most of the houses are old and run down. The lack of open space for expansion has added to the congestion. Most of the houses are home to multiple families. Since situation has impacted economic well being, quite a few families afford a migration. 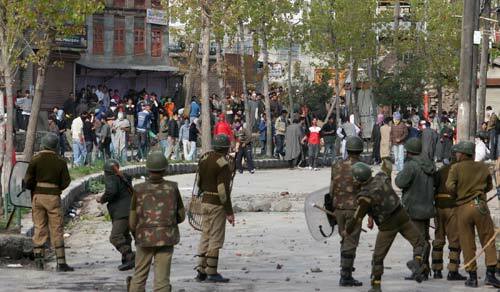 In such a mess when tear gassing starts; per shell impact is hundred times more than Lal Chowk.